The field of emergency management continued to evolve over the last eight years under the direction of the Obama administration. However, those whom work in the field have different opinions when considering whether the Federal actions have been beneficial to those in the field. In a survey conducted during the summer of 2016, county and municipal emergency managers from all 50 states were queried about their attitudes towards the Federal government’s actions under President Obama. Some local emergency managers feel the Obama administration and George W. Bush administration were one-in-the-same, while others feel one administration was more favorable than the other in terms of the work done and direction provided from FEMA and the Department of Homeland Security (DHS). As is suggested by the literature in the field, the feelings of local emergency managers to follow paint a picture of a policy field that remains fragmented despite efforts by the federal government to unify through policies that enhance command-and-control and centralization since the September 11 attacks. In many ways, the responses show a divided field in a manner somewhat similar to the current divisions in political discourse in American culture. The local respondents also had mixed feelings when comparing the actions taken and leadership expressed by the Bush and Obama administrations. Several respondents pointed to the increased availability of funding and proactivity of the Bush administration. Others, interestingly, said the same thing, but cited the Obama administration as providing clearer direction. For instance, one respondent said the second “Bush administration had a knee-jerk reaction to terrorism. Obama put more thought through it.” While another respondent claimed things were “much, much worse during the Obama administration. The Obama administration has taken great care to divide the country… bullying the states to conform to degrading and evil practices.” One dissatisfied respondent was much more blunt about the previous administration, saying “Obama is in the [toilet]” (the reader can imagine what was really said). Overall, the comments are reflective of a field in conflict as President Trump takes office, and seemingly has raised the stakes on fighting terrorism in the first month of his administration. This disconnect between local actors and federal policy demands is not unique to emergency management, as it could be any field that saw increased centralization and control from Washington, with little-to-no input from those at the street level. If a straightforward, seamless system for disaster preparation and response was desired by the policies that followed September 11, it’s clear that the outcome is not what was intended. 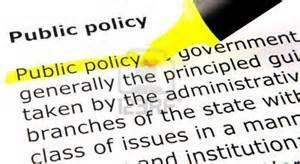 While the mission of the policies is centralization, the field remains fragmented. Just like other policy areas, the division over what to do, and who to blame is just as split as our national electorate. Author: Sean Hildebrand is an Assistant Professor in the Political Science department and Bowen Center for Public Affairs at Ball State University. He teaches an array of courses in public administration, public policy, and American politics along with managing student internships. His research focuses on emergency management and homeland security policy implementation and expenditures at the federal, state, and local level.